Sidney Godley, the son of a painter and decorator, was born in North End (Imberhorne Lane), East Grinstead in 1889. At fourteen he began work in an ironmonger's shop but with a desire for a more exciting life and six years later joined the British Army. 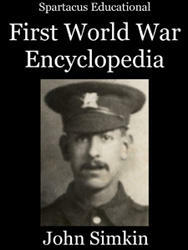 When the First World War was declared in August, 1914, Godley, a Royal Fusilier, was immediately sent to France to help stop the advancing German army. The Royal Fusiliers arrived in France on 14th August, 1914. They were moved forward to Mons in Belgium where the French Army was trying to halt the German advance. By the time the Royal Fusiliers reached Nimy on 22nd August, the French were having great difficulty in holding the Germans. It was decided to try and retreat to the River Marne, where they hoped they would be able to stop the German advance towards Paris. The Royal Fusiliers were ordered to hold two bridges over the Mons-Conde Canal while the rest of the British army retreated to the River Marne. 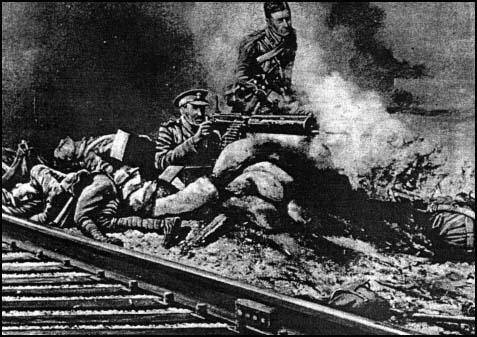 The Royal Fusiliers only had two machine-guns against six divisions of the German army. The Germans directed their fire at the two machine-gunners as they knew these men had to be killed before they could advance over the bridges. As soon as a machine-gunner was killed, another soldier moved forward to carry out the task. Eventually, the commanding officer, Lt. Steele, decided that his men would have to retreat. Before they left, Steele asked for two volunteers to man the machine-guns. Godley and Maurice Dease offered to do what appeared to be a suicidal task. Godley had to remove three bodies before he could get to his machine-gun. Within a few minutes of taking over the gun, Dease was killed. A shell exploded by the side of Godley and a piece of shrapnel entered his back. Although in terrible pain he continued firing at the Germans trying to cross the bridge. A bullet hit him in the head and lodged in his skull. Godley's single-handed defence of the bridge for two hours gave the men enough time to retreat. Godley was eventually captured by Germans soldiers and taken to a German field hospital where surgeons removed bullets from his head and back. News of Godley's bravery soon reached Britain. When King George V heard about what had happened he decided to award him the highest military medal available to a British soldier, the Victoria Cross. At the time it was thought that Godley was dead. However, it was eventually discovered that Godley was alive and recovering in a German prisoner of war camp. Godley remained in the camp until the Armistice. He was presented with his Victoria Cross in Buckingham Palace on 15th February 1919. After the war Godley became a school caretaker. Godley was also active on behalf of service charities and on occasions dressed up as Old Bill, the character created by the artist, Bruce Bairsfather. In April 1939 Godley attended the opening of a new bridge at Nimy. During the service a plaque commemorating the heroism of Godley and Maurice Dease was unveiled. Godley was also presented with a special medal by the people of Mons. Sidney Godley died on 29th June 1957 and is buried at Loughton Cemetery. In 1976 a new housing estate in Bexley was named after Godley. So also was a housing block in Tower Hamlets in 1992. On 23 August, 1914 at Mons, Belgium, Private Godley took over a machine-gun on Nimy Bridge when the lieutenant in charge of the section had been mortally wounded. 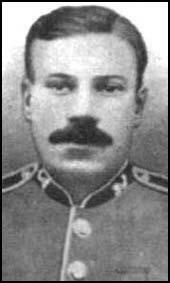 Private Godley held the enemy from the bridge single-handed for two hours under very heavy fire and was wounded twice. His gallant action covered the retreat of his comrades, but he was eventually taken prisoner. His final act was to destroy the gun and throw the pieces into the canal. (2) Sidney Godley interviewed on BBC Radio in 1954. The Germans came over in mass formation and we opened fire... We carried on until towards evening when the order was given for the line to retire. I was then asked by Lieut. Steele to remain and hold the position while the retirement took place, which I did do, although I was very badly wounded several times, but I managed to carry on. I remained on the bridge and held the position, but when it was time for me to get away I smashed the machine gun up, and threw it in the Canal.